Easter is April 4. Freak out moment. Yes. That’s only two weeks away. Have you dyed eggs yet? Last year tie dying (using men’s ties) and colored tissue papers were the trendy way to dye eggs. 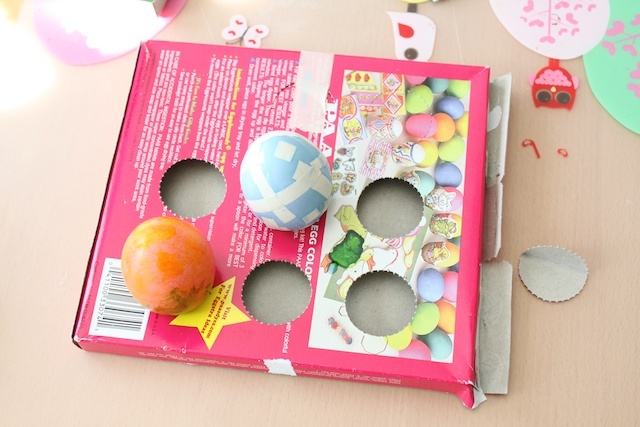 This year, I tried six other techniques that modernized Easter eggs. Kaye, my 3-year-old, and I had a great time testing new ways of decorating and dying eggs with things we had around the house. Also some tips to help you with the process. I put the dyes on top of a cookie sheet to contain any spilling. Be prepared with lots of paper towels. Egg dying tip #1: Dye the eggs while it is still warm. It helps the dye to dry faster. The warmer the better, but cool enough to handle with bare hands. The dyes were the boxed stuff you get at the stores. The box had cut outs to use as a drying rack for the eggs. I had plastic placemats or you can use newspapers or plastic table cloths to protect the table too. 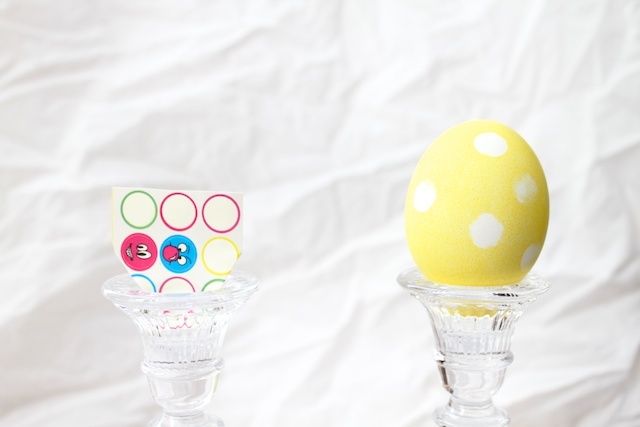 Egg dying tip #2: Use candle holders to display the eggs. It’ll make a nice center piece for the dinner table. This was one of my favorites. 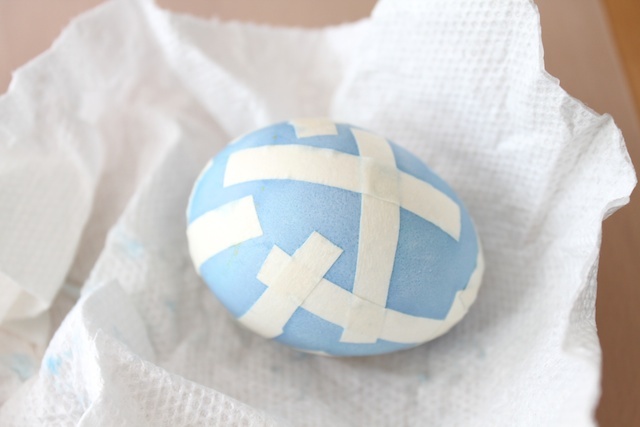 Cut pieces of tape to cover parts of the egg you do not want dyed. Make sure the tape is flat and watch the edges and ends. Any bumps or bubbles will allow the dye to seep through. 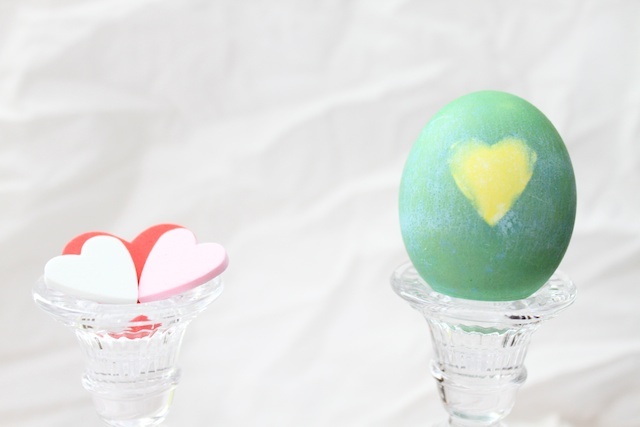 Egg dying tip #3: Once you reached the desired color when dipping the egg in the dye, take it out and roll it lightly in a paper towel to even out the colors. Avoid the dye puddling at the bottom of the egg. Then allow it to finish drying on the drying rack. I had leftover happy face stickers from potty training chart. I stuck some on the egg then dyed it. 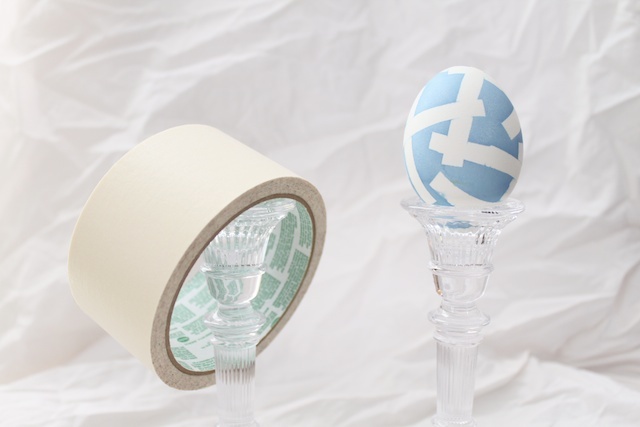 Like the tape technique, you’ll want to make sure the sticker is stuck flat on the egg and stuck on there well. You can also try star stickers or the 3-ring binder self adhesive reinforcements. Kaye did this one. This was her favorite. 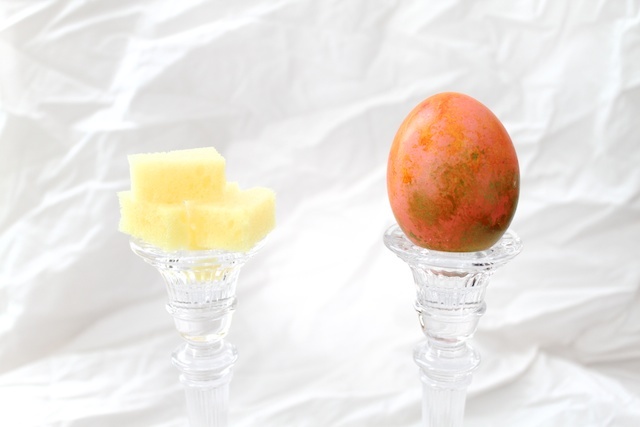 Take concentrated egg dyes and lightly dip a small piece of sponge in it. The less dye on the sponge the better the speckles. Then gently dab the dye onto the egg. 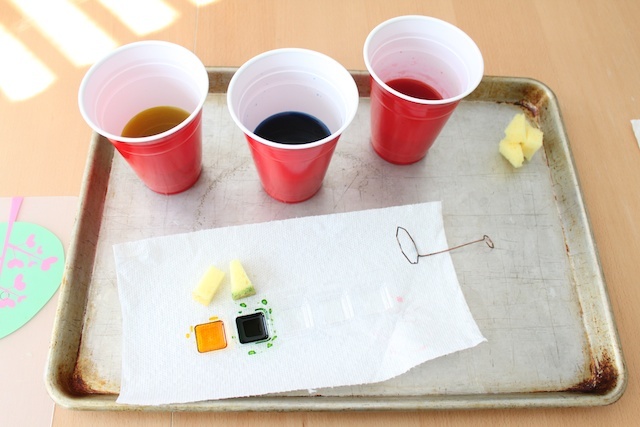 If the type of dye you are using doesn’t have concentrated liquid version, you can also use food coloring. With this technique, a little dye goes a long way. Gather some yarn and a non-toxic glue stick. 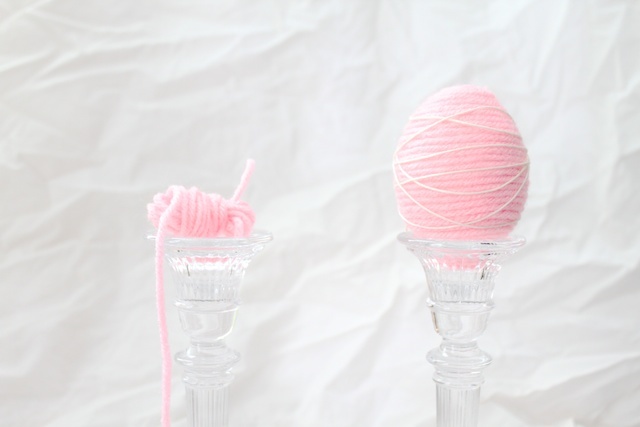 Apply ample of glue to the egg then coil the yarn from the top to the bottom. Apply some pressure to keep the yard glued well to the egg. I draped strings around the egg for a more dynamic look. No glue involved in the string because the texture of the yarn kept the string in place. I had some leftover heart foam stickers from Valentine’s Day. So I applied a heart to the egg, pressing down to make sure the heart shape was completely sealed. Then dipped into dye. 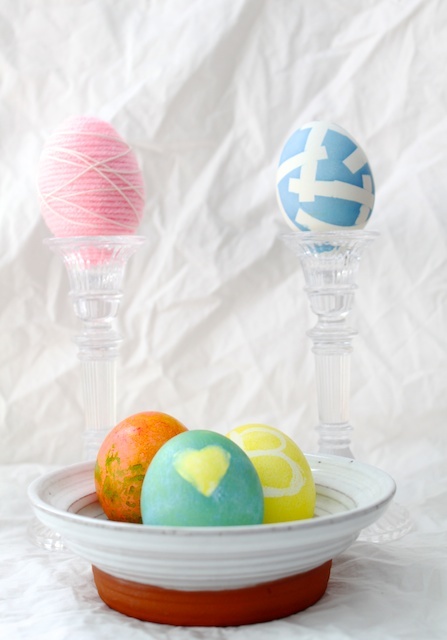 Egg dying tip #4: When doing two colors, always dye the lighter color first. Allow first color to completely dry before dipping it into the second color. 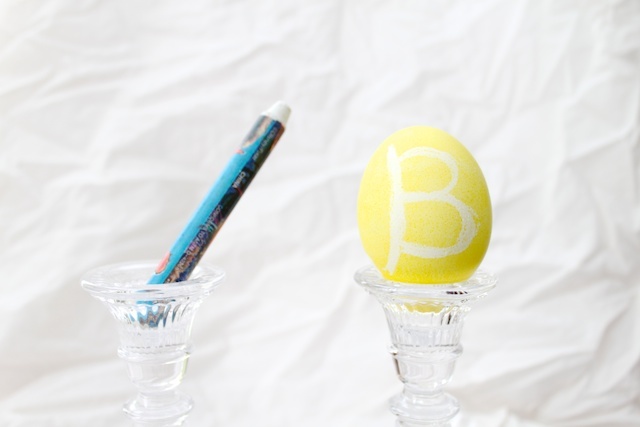 Freehand a drawing or write letters and words to the egg using a white crayon on the white egg. Then dip into the dye. Whatever you drew with the crayon will not be affected by the dye. » Tell me… Will you be dying Easter eggs this year? What are your tips and tricks? Happy Easter! Fun ideas Tiffany! I have been meaning to try the tape! the tape was my favorite. i think it turned out pretty cool. Great ideas. I so need to get a move on in this department! My tape falls off when I put it in the dye! Help! make sure the egg is not cold. get the good type of tape. they have stronger adhesive. and really rub it on there good. make sure there are not bubbles or creases. Ok! Thanks! I didn’t know that different tape stuck better! I’m excited about trying this.